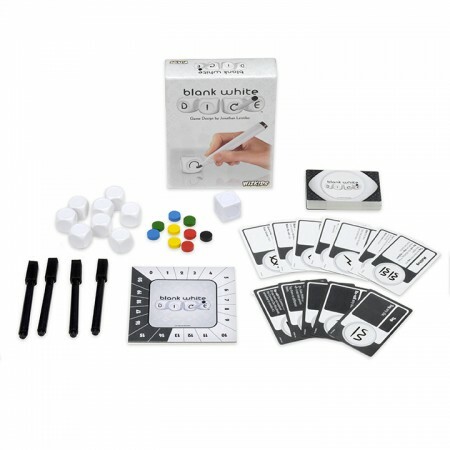 WizKids is pleased to announce its latest dice game offering, Blank White Dice! Designed by Jonathan Leistiko, Blank White Dice is an all new take on dice games. While normal dice are limited to what is printed on their six sides, in Blank White Dice the possibilities are endless! Blank White Dice hits stores this October and is a dynamic dice game, designed for 2 to 4 players, with multiple game play variants. Blank White Dice allows players to draw various icons on the faces of their dice, but those icons are not permanent. Faces will be erased and new icons will be drawn, all in a race to accumulate the most points. Compete with friends to be the first to reach thirteen points by drawing, erasing, and changing die faces. Players will roll dice and activate icons that appear face up: if you roll a blank, you’ll tag a face with an icon. Some icons will get you points, cause opponents to lose points, erase and change icons on one or more dice, force re-rolls, and many other opportunities. Strategically place icons on your dice while thwarting your competition by putting icons on theirs. With over 50 icons to tag on the dice, no two games will be the same!